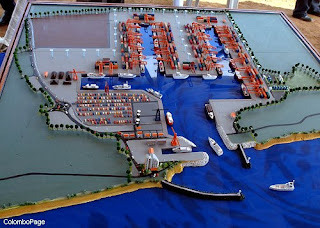 Sri Lanka Ports Authority (SLPA) is planning to start operating its upcoming Port in Hambantota by November 2010, said Ports Authority Chairman, Dr. Priyath B. Wickrema. by 2009 October, he said. Wickrema also said “ we have completed more than 50% key wall, 40% Excavation work, 100% of the Breakwater construction” while added that once completed the 1st phase will consist of 2 general purpose berths, one Bunkering berth and a small Craft berth which will be 120 meters long." SLPA is planning to call Requests for proposals during next month from willing investors to invest in projects such as Cement Bagging & Grinding, Fertilizer Bagging, warehousing, Bulk Transshipment, Car Transshipment and Car assembling projects, a BOI press release issued on July 9 said.